Not just military surplus, but they have expanded it to just regular civilian 223 also now for some reason. Petitions, not sure since it’s the WH site if it matters, but there is a link to NRA also and what they suggest. If you don’t shoot .223, it’s only a matter of time before they go after what you do shoot. 61000 signatures...surely more coming. I have heard that when the govt opens up any proposal to public comment, the govt has to respond to each before moving forward. Notice how this is guided under the need to protect law enforcement, but just who would shoot at law enforcement? Not the average Joe. Another issue to consider is that police officers wear soft body armor, not steel. From my understanding, any rifle round has the ability to penetrate soft body armor because it is designed to stop handgun projectiles. Friends who shoot thousands of rounds each year say these green tip rounds are no more effective at penetrating steel armor than a regular .223 round...which is why it is a surplus ammunition now. I have heard that when the govt opens up any proposal to public comment, the govt has to respond to each before moving forward. I can't comment on this issue, this is the first time I have signed a petition for on a WH site. I have even created another e-mail for my domain just for petitions, so they don't have my main e-mail address. Correct, an AR Pistol is a short barreled AR without a stock. This is how some get around the SBR (Short Barreled Rifle) NFA (National Firearms Act) registration and not have to pay a $200.00 tax stamp. But have the buffer tube sticking out the back for the bolt cycling with a direct gas system. Technically it is not really a pistol round per say. 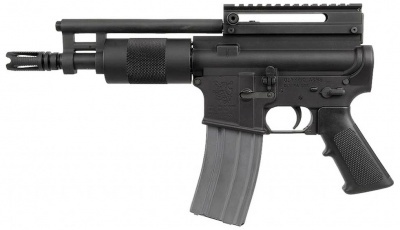 I'm seeing some now don't even have the buffer tube since the piston driven system has come out or they simply put the direct gas system over the top of the firearm. I'm not real versed on this type of pistol though, so have not studied it very much. Notice how this is guided under the need to protect law enforcement, but just who would shoot at law enforcement? Do you think criminals would abide by the law anyways....liberals are misguided and just want their agenda passed anyway they can. This is how ATF is trying to ban this round, it is focused on a 30 year old law. Even the writer of the law says it was not to be used for a rifle round such as the .223/5.56. The anti-gunners did not get the Assault Rifle ban they wanted, now they are trying to get around it by doing it this way and banning the ammunition to starve it out of existence. AR-15's even come in the 308 and now the Beowulf 50 caliber. The 308 has been around for a very long time also, which is another hunting round. At one time you could get an AR upper for the 12 and 410 gauge shotgun. They going to ban that also? Oops, I forgot that you could get the AR in 22lr round also, I guess they will have to ban that round also. Exactly, a shortened AR is considered a pistol for its lack of a stock....but it is still an AR. That was my point on the round....it is for a rifle and not a pistol. The gun banners want to ban it as a pistol round, but they are probably the same people who would load a magazine with the round facing the wrong way (and succeed). But they are probably the same people who would load a magazine with the round facing the wrong way (and succeed). What she didn’t appear to understand is that a magazine can be reloaded with more bullets. According to the Shooter’s Log, only early on were magazines for AR-15s designed to be disposable, but the military changed that and now magazines are used several times. In handguns, a magazine is designed to be reused hundreds of times. After her remarks, the audience in the forum at The Denver Post building chuckled. But if it will save just one child....isn't it worth it? Of course, when you are speaking to a group of like-minded people, why let facts get in the way? I'm all for saving men woman and children, I don't know anybody who would not be that way, that is unless they are insane or bent on destruction. Most have already forgotten about the OKC Alfred P. Murrah Federal Building bombing, my family has not. I had family and friends either in the building or at the YMCA just down the road. Fortunately, my relatives survived, but are deeply scared either emotionally or physically. Two of them were in the daycare center. Did my family try to ban Ryder and U-Haul trucks, fertilizer or diesel? It's not the instruments they use, it's the insane people behind the instruments. If they are dead set in wanting to do harm, they will find a way. I had a chance to visit OKC a few years ago...the park is very nice and a peaceful place! My statement was tongue in cheek...it's the rallying cry for the do-gooder activists and politicians. Yes, I agree. But he is burning in hell now. Yes, and I took it that way. I knew there was no disrespect intended. You would be surprised, maybe not, how many have forgotten though. I can't wait to get my Shrike belt fed AR-15 upper!